Antal Dorati was born in Budapest on April 9th 1906. He is best known today as a conductor, but he was also a composer of forty-five works including two fine symphonies, and a talented painter and author. 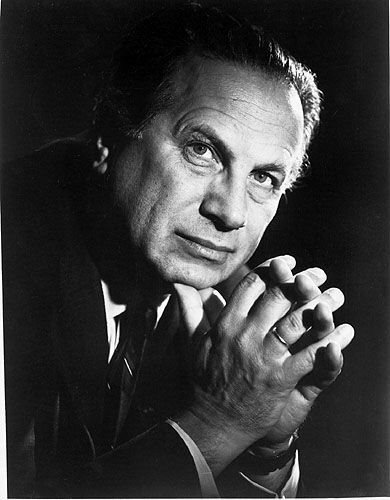 The last work that the 82 year old Dorati composed was a setting of the Pater Noster. This was completed in 1988, a few weeks before his death, and is a moving a cappella work for mixed chorus (SATB). It is difficult to understand why this beautiful five minute composition is not better known, or more widely performed. We are very fortunate though to have a fine recording in the catalogue by the Kammerchor der HdK-Berlin conducted by Christian Grube on BIS where it is coupled with another of his works, Jesus oder Barabbas? Sadly parts no longer seem to be available from his publisher Boosey & Hawkes. Antal Dorati resources On An Overgrown Path include Antal Dorati the composer and Who am I - attaca? . There is a simple explanations as to why Track 10 is applause. The CD is titled 'Concert for Lidice' and is a 1992 live recording held on the fiftieth anniversary of the German massacre in the Czech village of Lidice. The profits from the sale of the recording go towards the construction of a health and social centre for the village. The charity IPPNW Concerts which I have written about on a number of occasions regularly organises fund raising concerts such as this for deserving causes. The superb live Dorati Missa Solemnis was also recorded at one of these concerts, and this CD includes an opening speech on a separate track so it can be programmed out. I'll gladly put up with applause and speeches when the music, and cause, is so good. I heard Maestro Dorati conduct what I believe was the American premiere of Olivier Messiaen's 'Transfiguration de Notre-Seigneur Jésus-Christ', at the Kennedy Center Concert Hall, in Washington, D.C., during the Center's opening season, 1971-72. The concert was at Catholic/Protestant Easter Time/Eastern Orthodox Easter Time (Pashka). Maestro Dorati's conducting, programming, and humanism are deeply missed here. Don't even ask whether the current National Symphony Orchestra is programming a Dorati orachestral or orchestral/choral work in commemoration of the 100th anniversary of the birth of its former music director. Garth, I have just taken Antal Dorati's autobiography Notes of Seven Decades (Hodder & Stoughton ISBN 0340159227) down from my study shelf. When I gave the first American Performance of Messiaen's Transfiguration de Notre Seigneur Jésus Christ, many people asked me when the work would be available on records. But - back to the face-side - when, two and a half years later, the record had become available and was selling well, there were no letters or 'phone calls requesting a repeat live performance. Alas Maestro Dorati's Decca recording is now deleted. And don't forget the numerous recordings Dorati made for the Mercury Living Presence label, still bread and butter for audiophiles. Dorati also made another memorable Messiaen record, for EMI, when in charge of the BBC symphony Orch:Chronochromie, one of Messiaen's most complex and I would argue greatest works. This has also been deleted!!!!! I have both Dorati Messiaen recordings mentioned here: "La Transfiguration" on a Decca reissue CD (a greenish cover with a beautiful blue butterfly on the side, which also contains Preston's rendition of "La Nativite du Seigneur"), and "Chronochromie" (with Boulez and Koechlin pieces) on LP. The CD of "La Transfiguration" is one of my prized possessions. I have listened to all of the little clips from the latest recordings of this work on Amazon.com, and they all seem to pale in comparison. The sheer depth of sound Dorati achieved was extraordinary, and the tempi are perfect (by comparison, both the Sanderling and the Chung are far too sedate and civilized). There are lots of little noises in the recording (paper being shuffled, the odd thing being dropped, etc) but none of this matters given such a perfect performance. The only thing I regret is that Rostropovich is not on it. Janos Starker takes his place, and while he is excellent, I would have liked to hear what Slava did with this piece. I did not attend the American premiere (indeed, I was only 5 years old at the time! ), but apparently the chorus was all decked out in deep red robes, and Messiaen himself was absolutely overwhelmed by the performance. The "Chronochromie" has not aged nearly so well. This was recorded in the 60's, when it was popular to capture avant garde music in as dry a fashion as possible. Also, the orchestra sounds somewhat small. I don't know if you can imagine Messiaen's orchestral music sounding "conversational", but this does. However, I think this had more to do with the hall and the recording equipment than with the performance. Pierre Boulez's recording on Deutsche Grammophon is much better (sumptuous, in fact), if you're interested. I haven't heard the Boulez version, but the cd pressing seems pretty good to me and I think the performance is perfectly good.